Home › faith › Rejoice! or Exult? Catholics should be used to the new English translation of the Latin liturgy after four years. But at times like Easter, which particularly cut through and beyond time, it’s familiar words we want. The premise for the new translation was clear: in 2001, the Vatican declared that inculturation (in translator-speak “localisation” to the cultural context) had gone far enough and the liturgical language had to return as close as possible to its ‘authentic’ Latin source. 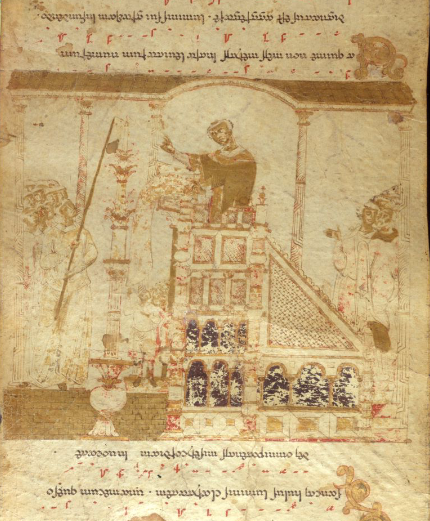 In the 1960s, Vatican II released a flood of vernacular translations of sacred texts, just a few centuries after some other churches had stopped using Latin. The wonderful ICEL (The International Commission on English in the Liturgy) collaboratively coordinated a chorus of Englishes from Australia to Wales, with plenty of space for local variation. But all that changed with the new translation, released in 2010. The new translation has some advantages. Having spent years attending mass in Polish and German, I recognised phrases such as “and with your spirit” instead of “and also with you”: the new English is closer to other languages as well as the Latin. Perhaps not a coincidence, as a Polish pope initiated the change, and a German one inaugurated it. That didn’t mean I liked it. This is a marmite translation; you love it or hate it; and my Catholic upbringing was far more “love and a guitar” than “holiness and rubrics”. The Exsultet is THE Easter text; it tells the story of salvation, the return of the light to the world, at the consecration of the Easter candle. And I grew up with it starting “Rejoice, heavenly powers, sing, choirs of angels! Exult, all creation…” The new translation starts “Exult, let them exult, the hosts of heaven, exult, let Angel ministers of God exult,” (see full parallel comparison of the English and Latin texts). This translation was always going to be a balancing act between literalism, singability, worship and global varieties of English, as ICEL explains. Yet the earlier one is more singable and prayable – and more like real English as she is spoke. My memory doesn’t stretch back to the Latin original Exsultet: “Exsúltet iam angélica turba cælórum: exsúltent divína mystéria…” But for those who do, it seems that this text was pretty “inculturated” too. The bees were introduced as a poetic debt to Virgil, as Rita Ferrone shows. The Exsultet used to be more like a jazz or a poetry slam – there were different versions, and what was fashionable around the time Christianity became the religion of empire made it into the standardised text we have today. The great bible translator St Jerome thought it was all unscriptural showing off. As ever, therefore, when we talk about translating more closely to the original text and culture, we have to pick our ‘original’ text and culture, and be honest about our choices. Whichever version you choose, Happy Easter! 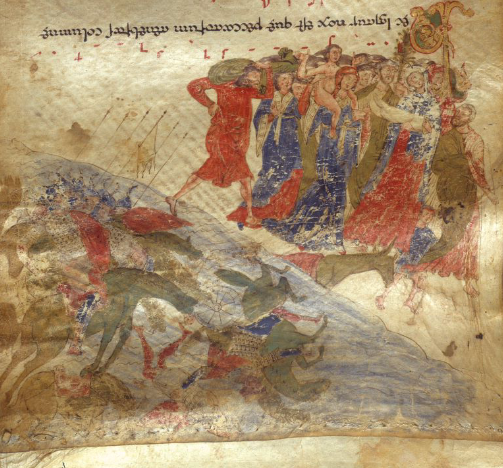 The images are from the 1075 Monte Cassino Exultet Roll, which is now in the British Library. They show the blessing of the Easter candle, and the Israelites escaping through the Red Sea, part of the salvation story in the text.